Last year, when I first posted my recipe for roasting garbanzo beans, a couple of my friends mentioned that a few of the beans popped in their oven! We quickly determined that the garbanzos still had a good bit of moisture clinging to them; a thorough draining and patting dry will prevent this. We laughed over the incident, and every time I make this crunchy snack I now think of these friends and smile. I figured it was time to update this recipe for several reasons. First, this occurrence gave me the thought to take the drying to another level. 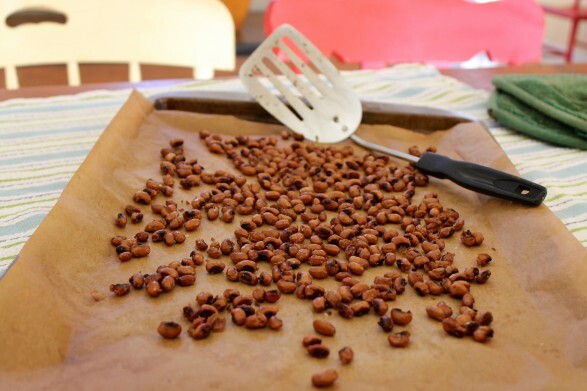 I now put the well-drained beans on a tea towel or a couple layers of paper towels and allow them to sit on the counter for a couple of hours to thoroughly dry. You can also put them in the fridge. In one case, I never got around to roasting the garbanzos, so I wrapped them up and refrigerated. I ended up forgetting all about them, baking them two days later, and they were perfectly crunchy and delicious. Lastly, because I love to experiment in the kitchen, I started to think that, if garbanzo beans taste so satisfying once roasted, why not other beans? Following the recipe are some photos with a few details about some of the other beans I have roasted. It actually started with a can of black eyed peas that had been in my pantry for quite a while. When they turned out crunchy and satisfying, albeit a little small, I decided that big butter beans could be the ticket. By the looks of them on the pan, I initially thought they were a big failure. But the looks belied the taste, and my son who does not like beans was the biggest fan! Now, I am buying more beans than ever! Whether you call them garbanzo beans or chick peas — and whether you roast this type or experiment with one of the many legumes available — they truly make a perfect snack food when roasted. They are an inexpensive, high-protein snack and can even be a crunchy, low-fat alternative to croutons in a salad. Put out a pre-dinner bowl when company arrives. From boring can of beans to clever hors d’oeuvres…who knew?? Note: I love the flavor of a simple sprinkling of sea salt, but you may certainly experiment with different spice. 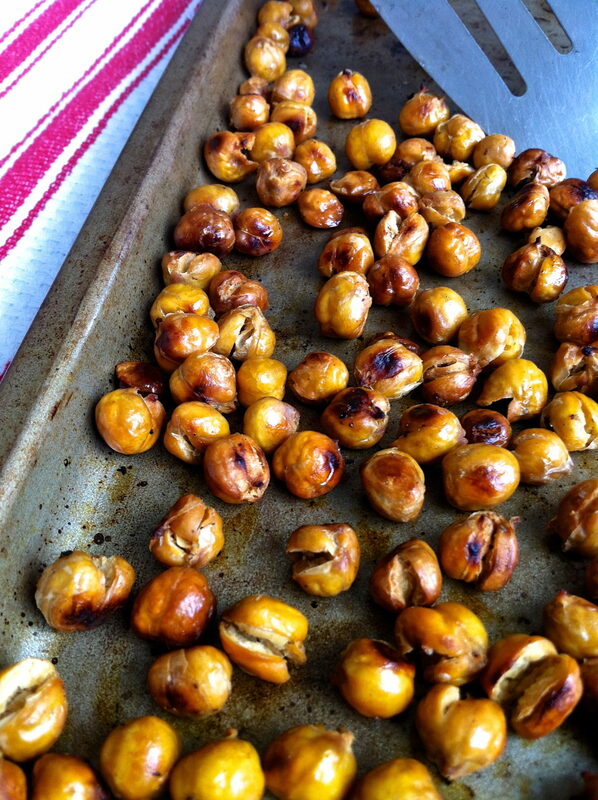 Click here for the recipe for Indian-Spiced Roasted Garbanzos. After making these many times, I have learned that allowing the garbanzos to get really dry and then reducing the oven temperature after the initial 15 minutes results in a thoroughly crisp snack with less chance of over-browning. You can even allow the drained beans to rest on a tea towel or a few layers of paper towels on the counter for a couple of hours. Beyond that, wrap and store in the refrigerator until ready to roast. 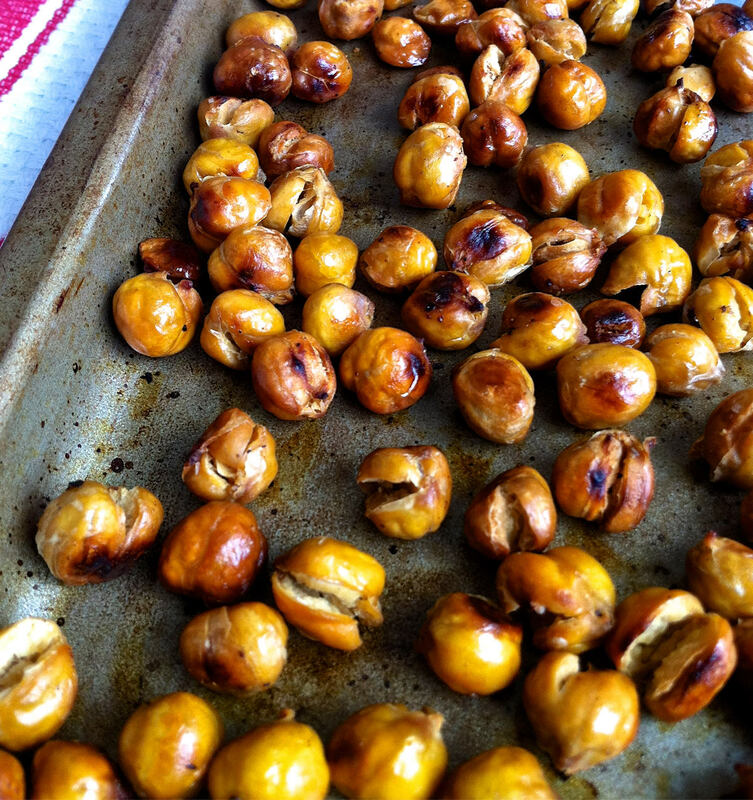 Place the garbanzos on a well-oiled baking sheet with sides. Drizzle with the 1 tablespoon olive oil and and toss (I like to use my clean hands) so that garbanzos are evenly coated in oil. Dark-coated pans often brown food more quickly than light-colored pans. If you are baking on a dark-coated pan, it is helpful to turn the oven temperature down by 25 degrees. Once cooled, if you taste your garbanzos and they are not completely crisp, simply return to the 350 degree F oven for another 10 minutes or so. A can of black-eyed peas that had been sitting in my pantry for far too long roasted up crunchy and delicious! This is the before picture of two cans of butter beans. Though the butter beans split and looked like a miss, I continued to roast them until they were crisp, and they were an unexpected hit. We all loved them and I will make again for sure. This recipe has been shared with Thursday’s Treasures, The Slow Roasted Italian, and Foodie Friends Friday. I have been browsing your recipe archives.. these look so yummy! I need to try making these again, it has been several years since I have. They would be perfect topping for a salad! I wonder if this would work with Hominy. I haven’t tried hominy yet but it has potential! If you try, please report back! Hi! This looks so yummy. Do we need to soak the beans before roasting? Or can they go from bin to oven? I use canned when I roast the beans. If you prefer to use dried, they should be cooked first. Hope you enjoy! You do NOT have to cook the dried beans first. You just cover them with water and then soak them overnight, and in the morning, drain as you would the canned beans and roast them. Add spices and/or a bit of agava syrup for a touch of sweetness, YUM! I will have to try this with dried beans. Thanks so much for the suggestion, Anne! We loved doing this with black-eyed peas. We still haven’t tried it with chick peas. But after seeing those butter beans, we’ll have to do those next. Great tips! So glad you liked, Greg! So far, all the varieties I’ve tried have been different, but all very good! In the Sunday paper I found all of your great recipes and will try all of them. this morning I made Pancetta, Kale, & Parmesan Frittata and this evening the Roasted Garbanzos. Both were excellent. I am a FCS teacher and will be sharing your nutritious recipes with my classes. Thank you for the thoughtful comment, Monica. I am so glad you are off to a good start with the recipes and hope your classes enjoy them as well. I look forward to future feedback! A faster way of drying them is to start at 250-300 F for twenty minutes before cranking it up to 450. You can put the beans in just drained from the can and you’ll have beans without the prep work. That’s a great method, John. Thanks for taking the time to share it! 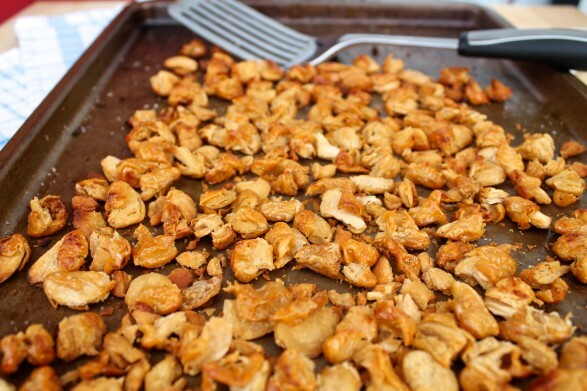 Crunchy and delicious…thanks for the very good prep tips. I was thinking of roast the garbonzo beans for a little shorter time period then using them to make hummus. Have you tried that? I think the roasted flavor would really be a hit in the hummus. I have not tried that, Dawn, but I think it’s a great idea. I bet it would add an extra dimension of flavor. I tried it as hummus and paired with roasted garlic. Best ever. Awesome, Sarah! Thanks for the feedback! When I entered jr. high, in the 50’s I first met people from Greece and the middle east. They used to pan fry chick peas and then dust them with a blend of salt, ground ginger, and garlic/onion powder and serve as an appetizer. I tried a recipe for these with similar directions and ended up with a burnt mess ( I think I used too much oil in addition to other factors). I started wondering about using dried chick peas, and not cooking them and/or not rehydrating fully to speed the roasting process. Have you done this at all? I have some in my fridge that I soaked for 4 hours & are almost fully hydrated (the very center is still firm, but not rock hard) and I am going to try roasting them tonight. I also considered pan roasting for better control of the process…Would love your thoughts on this. Thanks! Great question, Mary. I have tried with dried garbanzos and they will be very crunchy/borderline too hard if they aren’t cooked. I think I cooked mine about 30 minutes–until they were tender but not mushy. The other recommendation I would give is to make sure the beans are dried well with just enough oil to lightly coat. I hope that helps, and I’d love to know how you make out! My family really enjoys these, Ruth. I hope you and your daughter do, too! This sounds great and I can not wait to try it! Yea, a new snack; who doesn’t love salty, crunchy finger food!! Wow, these chickpea popcorn bites are delicious!! And this is coming from a 13 year old! I usually don’t like regual chickpeas, but in this form, I’ll eat them anytime! Love this recipe! Fabulous feedback, Kyndra! Thanks for taking the time to comment and so glad you like! I use canned garbanzo beans and try to rinse some of the sodium out. After patting dry, I toss them with garlic powder and Parmesan cheese.. Roast them for an hour at 350. They are yummy! I love your addition of Parmesan and garlic powder, Bernadette. Thanks for mentioning! They look absolutely delicious. I will try them this weekend. Thanks! Hope you enjoy them, Pam! They look yummy going to try. Any advice on storage and keeping crispy ? Hi Anna, If you store them in an airtight container, they should stay fresh for at least a week or two at room temp. If it’s particularly humid where you live, you could store them in the fridge. Either way, they hold up well as long as they’re not exposed to moisture. 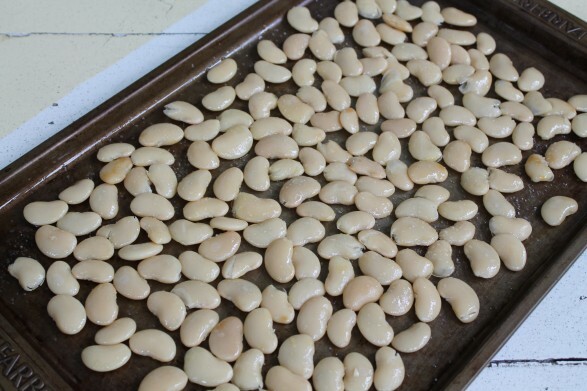 I roasted black, lima and white kidney beans. My gosh they are delicious! What a healthy way to have a crunchy snack! Thanks and keep the recipes coming. Hi Pam, So glad you enjoyed and tried with a few different beans. It’s sort of fun to see how they all turn out and which ones everyone likes the best! Thanks for sharing! I am looking forward to try this recipe. I am wondering if you could do the same with lentils? that would be yummy too. You could definitely try this with lentils. Just adjust the cooking time accordingly since they are so small. Are there recipes that add cocoa to add a chocolate flavor ? But need to be no sugars added for me. Artificial sweeteners are ok. I have never added chocolate flavor, Teri, although I have made this slightly sweet version: https://fountainavenuekitchen.com/maple-cinnamon-roasted-garbanzos/. You could use it as a guide, adding cocoa powder and a sweetener of choice. If you try, I’d love to know how you make out! I have a Traeger pellet grill …… if you roast these on this type of grill with a “smoke” period of a few hours, it dries out the beans nicely, then when you pump up the heat, they roast even nicer, and have a smokey flavor ……. The added smoky flavor would be fabulous. Thanks for mentioning! These are wonderful! Added smoked paprika and onion powder to the salt! Love the addition of smoked paprika and onion powder, Heather. So happy they were a hit! Wow! I only had a can of red kidney beans which I drained and placed on paper towels in a tray. As I live in Thailand I just placed them on a window in the sun to dry for about 2 hours — some started to split in that time. Dusted them with salt, chilli powder and turmeric (mainly because it’s so healthy for you) and grilled them in a fan-forced (big) toaster oven — top grill only at 200 C (roughly 400 F) for 10 minutes (absolutely minimum of oil — about 4 drops). Crispy in that time. Absolutely delicious — thanks for the recipe. I have a heap of dry beans (black, red, white etc. ), will soak and cook them tomorrow ready for another batch! This is fabulous, Steve! I’m thrilled they were a hit and appreciate your feedback! Thanks for this recipe. Now I know what I will do with the case of garbanzo beans I accidentally at Costco, thinking that it was corn. The label was so yellow and they were sitting next to green beans. Ugh. Yeah to these healthy “corn nuts”! Oh Brenda that’s funny…but not funny! Hopefully this recipe ends up making the garbanzos an unexpectedly better buy than the corn!